This course provides an understanding of the basic principles and fundamentals of radiation safety applicable to gamma and x-ray industrial radiography (IR). 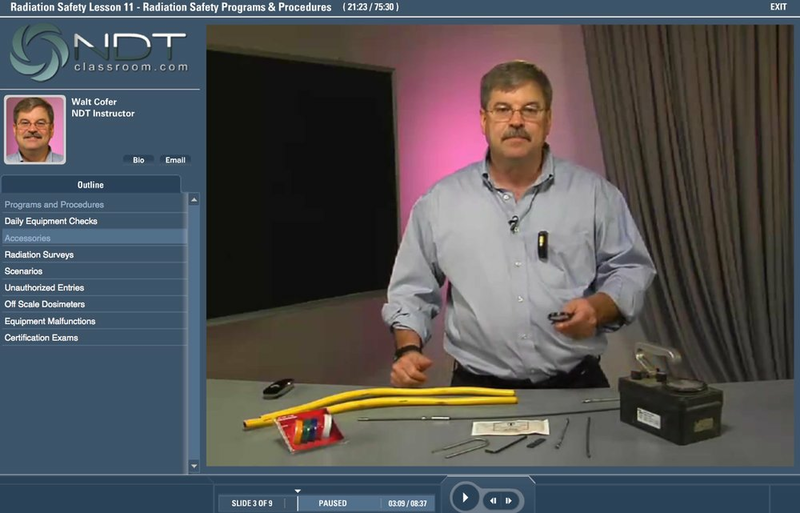 It addresses all required training topics specified in federal (10 CFR 34.43) and equivalent state radiation control regulations; and topics listed in App. A to ASNT CP-105-2011 (excluding neutron radiography). Learning outcomes are assessed using written quizzes at the end of each lesson and a comprehensive final exam. Completion of the course provides 28 hours of credit toward the 40-hour training prerequisite for the ANST IRRSP exam and equivalent radiographer certification exams administered by state radiation control agencies. After completing the NDTC course, the individual’s RSO provides the remaining 12 hours of site-specific training (addressing employer O&E procedures, state regulations, and hands-on instruction on radiography and safety equipment). It should be noted that site-specific training is required by federal (10 CFR 19.12, 10 CFR 34.43) and equivalent state regulations. Course content is supplemented with lesson summaries/glossaries (that also serve as certification exam study aides) and a recommended readings list to facilitate use of blended training methodologies. Additional practice exams are also available upon request. The course enables prospective radiographers to master required “body of knowledge” subjects at their own pace and schedule before they undergo site-specific instruction to complete their formal training. · Direct assistance with revising the customer’s in-house training program. 2. In cases where a course customer lacks access to an RSO able to provide the remaining 12 hours of site-specific training, NDT Classroom is available to assist with making arrangements for them to obtain the training.